BIM Troublemaker: Reader Email: Millenium Hilton WTF? I got this email yesterday, and i thought it would be worth posting up. If you send me a good question, I'll post your email too! And if its a really good question, I'll send you a bag of tasty Peppridge Farm cookies to boot! I am 31 years old currently working here in Dubai as CAD Technician. I am hoping to learn Revit as much as I can. I browse the internet for some tutorials and I am happy that I can little by little learn from it. I have seen in YouTube the sample of your Massing Study for the Millenium Hilton. Since the pacing is very fast and its hard for me to follow how did you do it, i would like to ask a favor, I am just trying for my own self study, to have a copy of your Revit file for me to review. By the way I am just new in using a Revit and I find it interesting to learn. I am more on AutoCAD and Microstation only. I am happy to help you out, not too long ago, I was a complete newbie at this too...I had to figure out alot of it on my own, which may or may not have been a bad thing.I can’t share the whole model, but i will tell you what i did, and i'll send you the head piece to take a look at. When I model, I usually create several 2d families that i use as profiles for my work. So the crown is basically one nested 2d family, copied onto 3 levels, with it’s parameters linked into new parameters in the host family. I then picked all 3 profiles and hit 'create form'….voila! The body of the tower was similar. I made one 2d family for the base level, one for the top of the taper, and another for the ordinary rectangle at the top. The base profile was toughest because i had to figure out how to control the curvature. I ended up creating a curve that i controlled using dimensioned reference points. 1) If you use 2d families as profiles, it helps to host them on a reference plane that moves, rather than trying to dimension them vertically. Alternately you can use the offset control, but I stay away from that for no reason other than preference. 2) Think the whole thing out ahead of time. 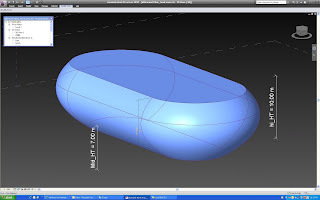 Break the form down to its constituent parts and the model will get alot easier. You will then see what needs to transform and what doesn't. With that understood, figuring out which parameters will have to be linked between the nest and the host will be a snap. The bulk of what you are seeing in Massing Study for the Millenium Hilton video is me placing these profiles in the host family and linking the parameters. Start small, start easy...find a simple building near you and just figure out how to model the mass....That’s what I did to learn Revit.